Most weekends I am in Kuno I go to Mr. H’s house/workshop/Aladdin’s cave to check progress and chat about planes, trains and automobiles. The recent news about Michael Bond has made me feel like Paddington Bear at Mr. Gruber’s antique shop. Mr. H was caught up in a ridiculous car accident recently – some imbecile backed into him trying to get out after after entering a one-way street in the wrong direction. 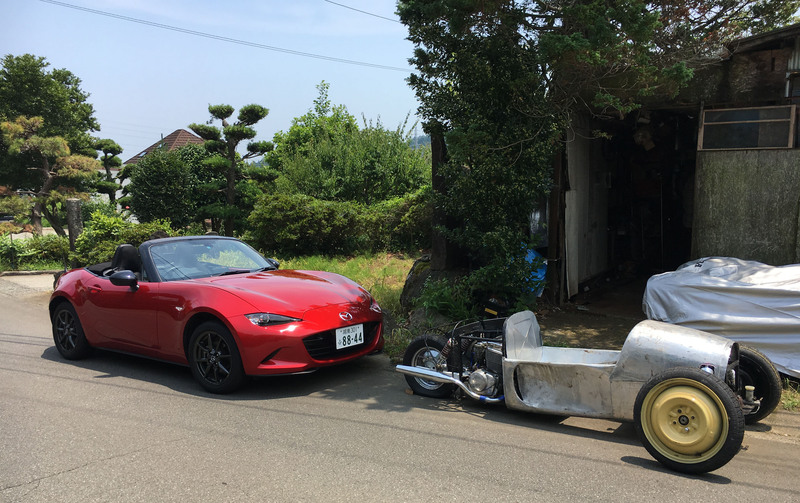 Now he is having physiotherapy for his back and it has, naturally enough, slowed down progress on 3-wheeler construction. 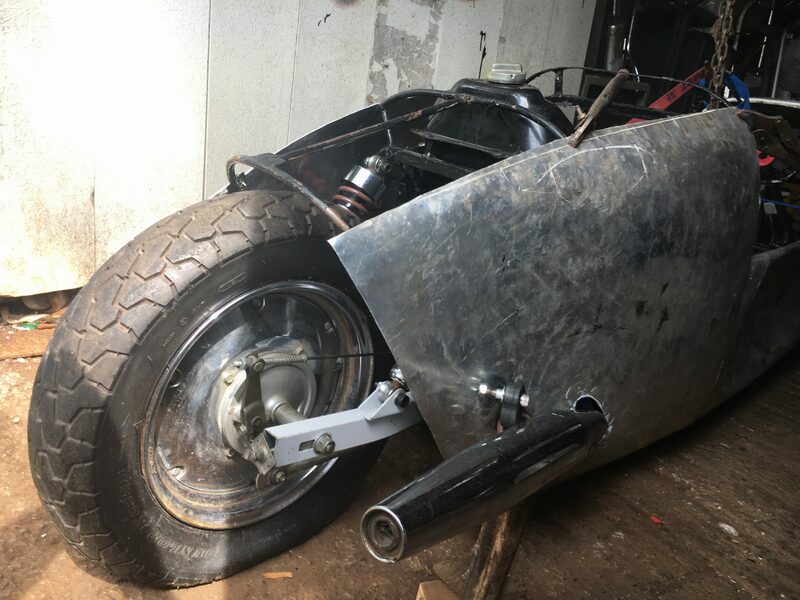 Despite all that, the 3-wheeler is coming together and really starting to take shape now. Here are a few photos from the last month to give an idea of its progress. Before taking the car outside, I had my first sit in it for a long time. 9th July: First fitting with the seat and pedals in place. Very tight but very exposed at the same time. The steering mechanism is in and interferes with the brake pedal heel position, so we need to find a fix. 9th July: Kuno consists of the western foothills of Mt. Hakone, a (dormant?) volcanic caldera. Hence the slope. 9th July: Under the silver cover is Mr. H’s personal Rover Mini-based gymkhana machine, also work-in-progress. 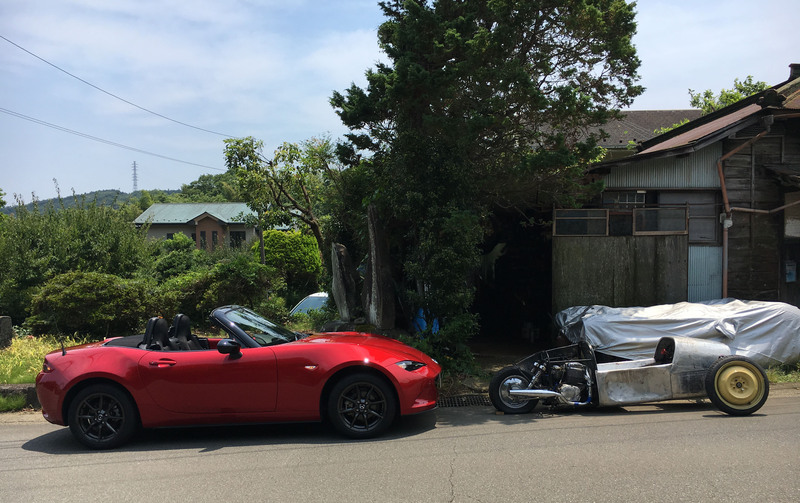 9th July: complete running gear and rear suspension from JDM 250cc Honda Rebel. 9th July: LHS exterior rear panel in place. 9th July: the Rebel engine is a tight fit and required some rerouting of the exhaust downpipes. The cladding on the pipes is to limit heat transfer to the seat-back bulkhead, but that will probably need some additional insulation. 16th July: RHS panel in place; we need to do something about that hole for the exhaust. 16th July: fuel tank also in position. All a very tight fit and we will probably have to replace those Rebel spring/damper units to increase ground clearance. 16th July: tight space for me. The floor is in place, and the combined gear/clutch lever. 16th July: combined gear/clutch lever. With my level of bodily coordination, this could end up like learning to drive all over again. Mr. H’s house/workshop is down in the valley, hidden by the tree on the right. Odawara and Sagami Bay in the background; beyond that, the Pacific Ocean.